SSS ITP 555 Series is a high-density gateway that supports both media and signaling in a single chassis enabling the Value Added Service providers to bring in their services very quickly and price-effectively. The 16E1/T1 Gateway is suitable for deployment in E1/T1 network, IP network and converged networks. This product comes in a stackable 1U Chassis, giving excellent cost factor, miniature, unique solution with GUI-Based installation and maintenance for small scale-needs. SSS ITP 555 Series is aimed at serving as a single development system for both media and signaling traffic. This flexibility enables the VAS providers to plan with different types of services with quick time to market and effective deployment of Next-gen Networks. This product has the capability to provide services that includes SMS, IVRS, USSD, MMSC, CRBT, MVAS, CMS (Content Management System) and 3G solutions. Our platforms are based on the most up to date technologies, assuring the efficiency and performance of all our products all the time. We provide an extensive array of innovative, scalable and flexible solutions and high integration level with client’s external applications. The messaging solutions range from a fully featured SMSC and USSD to small marketing modules for managing SMS traffic along with SMPP Servers. Every solution is fully redundant and customized to fulfill the client needs. All applications have a friendly environment for service design, configuration and monitoring, allowing the client’s to be updated about the platform status at any time. Our ready to deploy pre-built products are an ideal solution for Operators and Carriers willing to incorporate new services or enhance existing ones in a swift way with minimal investment on revenue sharing model. We commit to offer the finest and suitable solution adapting to our client’s requirements. Integrated Signaling and call control protocols for circuit and packet switched networks. Integrated VoIP module for Transcoding PCM-coded traffic to most common IP coders. SS7 signaling, call routing, call translation and IP transcoding supported in single chassis. Simultaneous support for SS7 signaling & SIP & PRI. 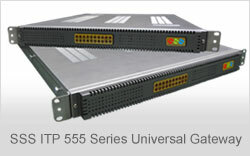 SSS ITP 555 Series supports up to 512 channels in a 1U chassis. Field proven, high voice quality.